Below we explain how currency gets into circulation via the Treasury, Federal Reserve, and banks, and the role Congress, banks, businesses, and you play in the process. We’ll also describe how the initial reserves become the economy in practice, the Fed’s role in controlling the money supply, and how money goes back into the system to help pay back our national debt. The topic is a little complex, so consider watching the videos for more insight. Comments are welcome below. Author’s note: I couldn’t find one source that explained central banking and how currency gets into circulation (not the simple answer, but the correct full answer). Given this, I’ve amalgamated a great deal of information below. I can’t promise that every detail is perfect at the moment, however I’ll be revising as I can figure out more. Please comment with insight and double check specifics as needed. There are about $1.7 trillion dollars of U.S. currency in circulation as of Dec 2018 (that is counting federal reserve notes and coins only). Depository institutions buy currency [federal reserves] from Federal Reserve Banks when they need it to meet customer demand, and they deposit cash at the Fed when they have more than they need to meet customer demand. Or at least, that is the simple version. Below I’ll add some nuance and complexity so you can better understand how currency gets into circulation and how it relates to the total money supply. The key to understanding “money in the US” and not just “dollars in circulation” is understanding the relationship between the treasury, federal reserve, banks, and congress, how that relates to federal reserves, bank credit, and the concept of broad money, and how all of that relates to the total “broad” money supply in circulation. Congress, Treasury, Fed, Banks: In overly simple terms, Congress spends and taxes. When congress spends more than it taxes, the Treasury has to issue bonds (IOUs) to raise money. The Federal Reserve (our central bank) buys Treasury bonds and then issues reserves based on that. Private banks then hold reserves and lend based on those reserves. Then people and businesses use reserve notes and bank credit to participate in the economy. The economic activity of banks, businesses, and people produces tax revenue. Tax revenue is paid back to the Treasury via the IRS. This is explained in detail below. Reserves and bank credit: Reserves come in two forms 1. reserve notes (physical currency and coins; in an electronic or paper form), and 2. reserve deposits (things like treasury bills and gold held in deposit at the Federal Reserve which commercial banks can hold as assets to meet deposit requirements and can convert into reserve notes to meet customer demand). Reserve notes are used as legal tender currency (official dollars) used by everyone, but reserve deposits are only used by the Federal Reserve and private banks. Bank credit meanwhile is what most of the money supply consists of, this is credit lent by private commercial banks based on reserve notes and deposits held. This system of lending based on reserves is called “fractional reserve banking” (the modern banking system). Fractional reserve banking: Most of the “broad money” in the economy exists as bank credit and is created through fractional reserve banking (where banks hold reserves that are equivalent to a fraction of their deposit liabilities). This is the practice of lending bank credit based on reserves held by commercial banks, but not the direct lending of reserves by commercial banks. Because bank deposits are usually considered money in their own right, and because banks hold reserves that are less than their deposit liabilities, fractional-reserve banking permits the money supply to grow beyond the amount of the underlying base money originally created by the central bank. About 97% of currency in the economy is created this way. That means most legal tender currency in the U.S. exists in the form of bank credit. Broad money: All notes, coins, bank credit, deposits, and even other types of money (see a list of money types by different measures; ex. M0, MB, M1, M2, M3, MZM) calculated together, can give us an accurate representation of the money supply (and a way bigger number than $1.7 trillion). The term “broad money” is used to refer to a calculation that considers most money types together (generally a measure of “M2, M3, and/or M4“). Total money supply in 2018: Depending on the calculation you’ll get different values. However, to give a general idea the MZM (a measure of all liquid money; that is money that could be exchanged for reserve notes on demand) as of Dec 18 2018 is $15.67 trillion (i.e. most of the liquid money in circulation is not paper or digital reserve notes or coins). Meanwhile, if you count ALL currency and credit derivatives (so every type of money and every product created from credit/debt), you get something like $580 trillion (according to USdebtClock.org at least). For reference, again using debt clock numbers, in Dec 2018 Debt is $21.8 trillion, GDP is $20 trillion, and we are running a deficit. The Fed can influence the money supply by modifying reserve requirements, which are the funds that banks must hold against deposits in bank accounts. The Fed can also alter the money supply by changing short-term interest rates. The Fed can affect the money supply by conducting open market operations (buying and selling government securities like Bonds in the open market through intermediary banks). When the Treasury needs more money, it prints bonds. If the Fed wants to increase the money supply, it buys government bonds. This supplies the securities dealers who sell the bonds with cash, increasing the overall money supply (as they can lend more based on fractional reserve banking). Conversely, if the Fed wants to decrease the money supply, it sells bonds from its account, thus taking in cash and removing money from the economic system (it essentially trades bonds and reserves back and forth with specific commercial banks to control the money supply). Bottom line: The Treasury issues bonds when more money is needed to fund government spending. When congress doesn’t balance the books, this creates a deficit which leads to debt. The Federal reserve manages the money supply and plays middle man between the treasury and private banks. At the end of the day, most of the broad money in the total money supply comes from commercial bank lending based on federal reserve notes and deposits (mostly Treasury bonds). Open your wallet, look at a dollar, it is a Federal Reserve Note (“a paper reserve note” AKA “a Dollar Bill”). Federal Reserve Notes are legal tender currency printed by the Treasury for the Federal Reserve banks. If you have some change on you, this is the same thing only in coin form. Now look at your debit card; it represents the same type of entity as physical Reserve Notes, except it is in an electronic form. This is legal tender, but unlike bank credit, can be converted into reserve notes; so it is similar to paper reserves, although specific FDIC rules apply. Reserve Deposits: Private banks need to hold federal reserves in order to lend bank credit. They can hold reserve notes (these are dollars and coins in the paper or digital form), or they can hold reserve deposits (this represents assets like treasury bonds and gold held by the federal reserve in deposit). Private banks can convert federal reserve deposits into federal reserve notes and vice versa to meet customer demand. In July 2017, the Federal Reserve’s balance sheet showed $2.5 trillion in Federal Reserve Deposits and $1.5 trillion in Federal Reserve Notes. Both bank credit and electronic and paper currency are a form of “legal tender” “currency” in the United States. The same is true for checks and anything else used as a medium of exchange officially recognized by the state that you, or the government, can pay taxes with. More specifically, it represents credit from our national bank (the Federal Reserve) which holds collateral, mainly Treasury securities and specifically United States “Treasury Bonds,” which are IOU’s mandated by Congress and issued by the Treasury, and are also known as America’s debt. Thus, our currency at its core represents roughly a share of the national debt, but it represents this indirectly through our nation’s bank and sometimes other banks and institutions as is the case with credit and securities. Meanwhile, most currency in circulation is money created by Commercial banks through lending, fractional reserve banking, and investments. Thus, there are a few layers of credit/debt to consider in-between bank credit, reserve notes, and treasury bonds. TIP: The concept of debt and credit is that it helps the economy grow faster than it otherwise could. A healthy amount of debt and credit, with reasonable interest rates, can be offset by economic growth and taxation. – Founding Father, Founder of the First American Political Party, First Secretary of Treasury under George Washington, Founder of the American System with Henry Clay, and the Person on the $10 bill Alexander Hamilton (see an article on Hamilton and national debt). Thomas Jefferson vs Alexander Hamilton (AP US History – APUSH Review). The Antifederalists vs. the Federalists; America’s founding factions butted heads over key issues of taxation, spending, and debt (just like we do today). HINT: The terms reference federalism, but they also mean exactly what you think, the federalists favored central federal government, the antifederalists, not. Learn about the namesakes of the historical U.S. political parties. Our current banking system evolved from the old Greenback system, but with an extra safety net, the non-profit and independent (within the government) Federal Reserve (the central banks that together form “our nation’s bank”). The check and balance system between Congress, the Treasury, the Fed, IRS, SEC, Commercial banks, investors, businesses, etc. is meant to ensure the health of the economy. It is also designed to ensure the value of reserve notes (our nation’s underlying currency), while also maintaining a healthy employment rate, steady growth, reasonable inflation, and average long-term interest rates. Federal Reserve Notes VS. United States Notes. Once you get over the shock, it makes sense. The Federal Reserve notes (paper currency). and electronic reserves (electronic forms of reserves, of which there is more) are our nation’s currency. The Modern Debt-Backed, not Gold-Backed, Economy: Currency is backed by debt, or backed by securities held by the Fed (mostly treasury bonds; but some gold and some other specific securities too). This isn’t suspicious; it is a necessary evolution of banking. The securities are “the new gold standard” as they represent IOUs from the United States, and thus “have value” in this respect (their value being “the faith and credit” of the U.S. and its expected ability to repay with interest). The Great Depression occurred when people made a run on the banks; we never want that to happen again and post-2007 regulations have helped ensure that. The value of the securities held by Fed, and thus the value of U.S. currency, is retained through the general health of America and through a system of checks and balances which prevent the Congress, Executive, Private Banks, Treasury, or Fed from easily inflating the economy. See: Is U.S. currency still backed by gold? TIP: See the History of the Federal Reserve to learn about the evolution of the economy to understand why the system of checks and balances is vital despite its oddities. The Federal Reserve (“Fed”) is the Government and Banker’s bank and regulatory body which affects monetary policy but only indirectly affects fiscal policy. The Department of the Treasury (“Treasury”) is a Mint, a regulatory body, and the only entity which can print currency or borrow for the US when authorized by Congress. The Treasury works together with specific commercial investment and lending banks and Congress to borrow money for the Government. They borrow for everything from the budget to the payroll of government employees. This is done by the Treasury issuing bonds, the Fed buying them, and then the Fed issuing reserves based on that. Congress requests money from the Treasury; it authorizes the creation of X amount of debt. The Treasury then creates Bonds (and other securities) and puts them up for “open market” auction. The Fed buys the bonds at auction through mediatory Primary Dealers, which are investment banks authorized to play this role. Commercial banks then trade Treasury bonds back and forth with the Fed giving commercial banks reserves to lend from and allowing the Fed to affect the money supply by taking paper currency in, putting more paper currency out, taking electronic reserves in, putting more reserves out, and loaning to banks as needed (implementing monetary policy to achieve the prime objective of the Fed). Almost all of this is done electronically, although physical currency can be exchanged and printed as needed (replacing its value in digital currency). Meanwhile, the Treasury takes the currency it made from selling bonds at auction and uses it for federal spending like Medicare, Medicaid, government payroll, etc. Then the banking system “creates” new currency by issuing credit and charging interest as it lends using fractional reserve banking (so businesses can run and people can buy products and invest in things like homes and new businesses). About 97% of currency in circulation is an electronic currency “created” by commercial banks though lending. That means the broad money supply is a lot bigger than the reserve currency in circulation. The Treasury and Fed seed and help regulate this whole process, but mainly the Fed impacts our nation’s monetary policy (managing the money supply) and the Congress (and sometimes executive) affects fiscal policy (spending and taxation). Finally, the Federal Reserve pays the Treasury back most of its interest earned and sometimes more. When the IRS collects taxes, the Fed plays the role of banker again as it handles repayments to the Treasury and interest payments. Ideally, the IRS collects a nice chunk of taxes from all the wealth the system helped build on of America’s debt, but that is always going to depend on the American taxpayer and Congress. During this process, Congress, the SEC, the Federal Reserve, and the Treasury all work to regulate the process making sure the money supply matches up with what is being produced to keep the velocity of money steady and to prevent a rapid deflation or inflation of the economy. When things aren’t balanced, the Federal Reserve can step in and adjust rates, preform open market operations, adjust reserve requirements, etc. The Treasury And The Federal Reserve. From this full lecture “Modern Money & Public Purpose 6: Fiscal vs. Monetary Policy“. TIP: The Fed and Treasury are meant to check and balance each other (just like the other parts of Government). The quasi-private nature of the Fed helps ensure the U.S. economy remains steady and that the U.S. retains good credit. TIP: Individuals and businesses can also buy bonds and other Treasury issued securities at the open auction, see TreasuryDirect.Gov. TIP: Read The Treasury And The Federal Reserve from Investopedia, and Borrowing and the Federal Debt, Where Does the Money Come From, and Where Does the Money Go? from NationalPriorities.org. As touched on above, we have been off the Gold standard for some time now. We had been weaning off of gold for a while, in 1971, President Richard Nixon unilaterally ordered the cancellation of the direct convertibility of the United States dollar to gold. This act was known as the Nixon Shock. Earlier Kennedy did a similar thing with Silver. Both the American and most of the world banking debate and currency debate are long over. Hamilton’s national bank and Jackson’s independent bank lost the banking debate, and Wilson and J.P. Morgan’s Fed won. Likewise, the silverbacks and gold backs lost the currency debate, and the greenbacks won. Today and Americans have been off the gold standard for a long time using “fiat currency” backed by the debt of IOU’s from the Treasury. Currency isn’t Backed by Gold, but is it Redeemable in Anything? So it’s backed by another currency. Essentially, as long as the United States is OK the money is OK. If it’s not OK, then the us and the world all have bigger fish to fry. Remember, “making a run on the banks” caused depression and utter chaos and devalued the currency (indirectly; see here). Even if reserves could be redeemed in beautiful golden nuggets, it would be in our common interest to hold securities (rights to the cake) instead of eating or hoarding the cake. However, if you want your assets backed by gold, then buy gold either as gold securities or actual gold. There is nothing wrong with holding commodities, although a diverse portfolio is typically a better bet. TIP: Capitalism is the investing of money and the utilization of money. It can be tempting to hoard “cash under the mattress,” but it is better for the economy to participate, invest, grow your business, etc. This is true for all income levels, and this is one of the reasons a fair tax code is important. When people hoard, the Fed has to inject more money into the system, and this can cause inflation due to an increased money supply. There is no virtue in hoarding, but there is a virtue in saving, likewise there is no virtue is greed, but there can be a virtue in charity (and philanthropy). Luxury may also have a positive effect on the economy as it pumps money back into the system when done well. As in all things, moderation is needed. “The duty of “saving” became nine-tenths of virtue and the growth of the cake the object of true religion.” – Father of Macroeconomics John Maynard Keynes on not eating the cake and thus avoiding the hoarding and hyperinflation that happened in Germany post-WWI. TIP: The Treasury Prints Federal Reserve Notes, what most people think of as “money,” but the Fed can also issue electronic reserves to banks, so not all money in and out of the economy is paper money. Money As Debt – Full Length Documentary. An interesting look at the banking system from its origins to today. There are two types of videos on this page “the skeptic” and the “not skeptic”… this is a skeptic one. TIP: Currency is a medium of exchange, money is something that can be traded in for something else of value. Since the dollar can only be traded in for debt, despite “having value” it is currency (as is a bit coin for example). Specifically, the dollar is Fiat currency (“because I said so” currency); it is legal tender whose value is backed by the government that issued it. See: Fiat Currency: What It Is and Why It’s Better Than a Gold Standard. FACT: Spain thought they had struck gold (pun intended) when they discovered the mineral rich New World. However, they misunderstood economics and caused a massive inflation by inflating the money supply too rapidly. If we only have X amount of goods and services then inflating the money supply too quickly inflates prices; it creates more money, but not more goods or services. This was the Spanish Price Revolution or Price revolution. This concept explains why “free-silver” was a bad idea back in the late 1800’s and hints at why the underlying economic issue in this, this New New World, is not fiat, silver, or gold but a matter of supply and demand. Christopher Columbus: Bankrupting an Empire. The economic principles behind the Spanish Price Revolution are why, despite our fiat currency, the Treasury and Fed don’t and wouldn’t “just print money for nothing” as the next video insinuates. Instead they work hard to “control the money supply” and prevent inflation to ensure a stable economy. How Much Currency is in the Economy? NOTE: Specific numbers will change every year, and I might not always come back and update this section of the page. That said, the concept stays the same even when the specific numbers change. If you want the latest, you can always check “FRED” for the latest M3, MZM, etc. As of July 2013, currency (U.S. coins and paper currency in the hands of the public, foreign and domestic) in circulation totaled about $1.2 trillion dollars and consisted of mostly Federal Reserve Notes. For comparison as of June 1, 2016, approximately $1.46 trillion was in circulation (money is created and taken out of circulation in cycles). This does not count electronic reserves held by banks. As noted above, this amount tends to grow on average, for example in 2018 it was $1.7 trillion. On the Treasury end of things, During Fiscal Year 2014, the Bureau of Engraving and Printing (which is the only entity can mint physical currency) delivered approximately 6.6 billion notes to the Federal Reserve, producing approximately 24.8 million notes a day with a face value of about $560 million. Meanwhile, the total currency (counting electronic money in banks, reserves, debts, credits, etc) was significantly higher (see Federal Reserve Balance Sheet). In the markets, where “shares” of companies and securities (shares of assets like mortgages and bonds for instance) are traded, the value of share trading rose 41% worldwide to $114 trillion USD in 2015 compared with $81 trillion in 2014. Most of the currency in circulation is not USD, but U.S. households saw their total net worth rise to a record level of $84.9 trillion in 2015. For comparison, Bill Gates has a net worth of very roughly $80 billion and the World very roughly $241 Trillion. To understand why there is more circulation in the economy than “paper currency in circulation” you need to realize that a single bit of currency is traded more than once in a day. This process is known as the velocity of money. There are also electronic reserves, and banks can lend based on electronic reserves and on fractional-reserve banking. The value of many things, like Bonds, is based not on the current value of an asset, but its value over time, although assets can be traded today based on their future value. See “How currency gets into circulation” by the NewYork Federal Reserve, or 2015 Market Highlights PDF, or “How Much actual money is there?“. 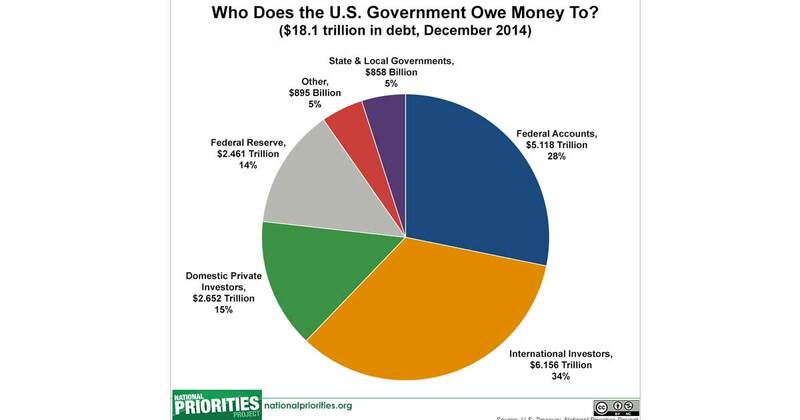 TIP: In 2014, the Fed sent $98.7 billion of its $101.5 billion total net income in 2014 to the U.S. Treasury. Why some say the Fed has “no money” despite having physical reserves like gold (they issue reserves – electronic currency – and hold bonds). What is the Fed, Treasury, Congress, Banks? What is “the Fed”? : The Fed is The Federal Reserve System, a system of independent banks established in 1913 that serve as the central bank of the U.S. “to promote sustainable growth, high levels of employment, stability of prices to help preserve the purchasing power of the dollar and moderate long-term interest rates.” Its primary method of accomplishing this task is through its influence on monetary policy, namely the raising and lower of interest rates. The Fed offers lines of credit to the Treasury and thus Congress and the American people. It is “essentially” the only thing that can extend credit to “bail out” America. It can lend to U.S. banks and the treasury, and it can do so at a “discount rate” if necessary. For this, it charges interest (see “net interest payments” to the Fed). What is the Treasury? The Department of the Treasury was established in 1789 the same year the Bill of Rights was signed. The Treasury collects taxes, pays our bills (like the debt and interest owed to the Fed), and manages government revenue. Its official mission is to “serve the American people and strengthen national security by managing the U.S. government’s finances effectively, promoting economic growth and stability and ensuring the safety, soundness, and security of the U.S. and international financial systems.” In terms of the currency cycle, the Treasury issues bonds and notes which represent debt in exchange for currency. This is where the national debt comes from. When the Treasury collects taxes, it pays down the national debt and thus pays back the Fed and other bondholders to reduce further interest payments over time. See why the CBO keeps nagging about debt-over-time. Just as the Fed is the only entity that issues credit to the U.S., the Treasury is the only entity that can create debt for America, and Congress is the only entity who can authorize it. TIP: The federal debt is the sum of the debt held by the public – the money borrowed from regular people like you and foreign countries – plus the debt held by federal accounts. Debt held by federal accounts is the amount of money that the Treasury has borrowed from itself to issue bonds. Banks buy the bonds, which are traded by the Fed. The Fed controls interest rates to keep the money supply balanced and prevent inflation or deflation. See also Quantitative easing). The Treasury Story 1969 United States Department of the Treasury; US Treasury History. Thanks, Alexander Hamilton first Secretary of Treasury. What is Congress? As Mark Twain once said, “Imagine a…” (kidding). Congress is the House and Senate of the United States. The “legislators,” or the elected officials who make the laws (including the budget which requests money for public programs and spending). Understanding the National Debt and Budget Deficit. Wait, who put these guys in charge? Oh, we did. I get it now. Mixed systems and checks and balances keep any one faction from upsetting the apple cart too much. What are “the banks”? Banks, in this case referring to Commercial banks and not the Central Federal Reserve Bank, are private depository, investment, and insurance moneylenders subject to regulation. However, since the repeal of the key banking related provisions of Glass-Steagall, banks have been under much less regulation. It is arguably the repealing those provisions which were enacted in the emergency of the great depression that led to the Financial Crisis of 2008). On the plus side, new Federal Reserve policy and new policy under President Obama (including, but not limited to, Dodd-Frank, the Basel III Liquidity Coverage Ratio and Capital Standards, and new rules for money market accounts) has staved off some of the core problems surrounding the repealing of Glass-Steagall. In general, it is regulation, not Glass-Stegall by name specifically that is needed. Fractional Reserve Banking Explained – Modern Money Mechanics. Another example of a great video that is super negative in tone. TIP: The Fed, Treasury, Congress, and institutions like the SEC all have regulatory power. Thus, unlike most systems, private banks, legislative powers, and executive powers all have joint responsibility in the economy. When you count the role of judges in this, we can say all public branches and private banks have regulatory power and responsibility. See The Relationship Between the Treasury and The Fed. TIP: The Federal Reserve can control the size of the money supply by controlling how much money the banks keep in cash (which is loanable) compared to how much money they keep in bonds (which is not loanable). To increase the money supply, the Fed moves money from bonds into cash (by buying and selling bonds). The reason this is needed is that, like with the Spain example, too much money inflates prices (one reason, aside from avoiding unpayable interest, as to why taxes are important, why bubbles must burst, why the velocity of money is important, and why fractional reserve banking needs limits set on it). See: How the U.S. Federal Reserve Creates and Destroys Money Bonds Are Only Part of It. Congress requests currency via “the budget” if it has a deficit rather than a surplus because it has not “balanced the budget” (see the Federal Budget Process). It can also request money for other purposes such as payroll of government employees. The Treasury prints bonds, short-term Treasury notes, and other securities. The securities are purchased by the Fed indirectly through “primary dealers” via open market Treasury Auctions (this is required by law, they can’t buy direct. However, they are required to get the best deal, and those primary dealers get a cut for being middlemen. The Treasury bonds, securities, notes, etc. can be bought by anyone including you (see treasurydirect.gov). TIP: Bond = an IOU AKA creating “the national debt” to finance spending. Now, with the bonds sold, the Treasury has legal tender currency for Congress’s budget and has added to the national federal debt, as is represented by the bonds. (This is how borrowing works; only the Treasury can mint new currency despite the Fed being heavily involved and ensuring enough bonds are sold). Meanwhile, the banks trade bonds and currency (mostly electronic) back and forth with the Fed. The Fed issues “Federal Reserves” (mostly electronic money, but sometimes paper money printed by the Treasury as needed, like before a holiday) based on the value of the bond and backed by its held assets, which are mainly securities. Now, back to the Treasury. The Treasury now has currency instead of bonds on hand, and can fund the accounts mandated by Congress including Medicare, Medicaid, Military, Social Security, etc. See “How is Medicare Funded?” for examples. Obviously, this currency is now in circulation, so currency goes into circulation this way too. Now, back to the banks. The banks made a little money off the swapping of IOU’s between the Fed and Treasury, and now they have currency to lend (plus reserves, bills, notes, and other assets). They can lend from their reserves, but not their bonds, and this is part of what allows the Fed to control the money supply. Plus, people invest, buy insurance products, and deposit, so the banks have plenty of other ways to ensure themselves. Now, people take out credit at interest from banks. They borrow currency and then make other investments themselves. Since banks can lend based on fractional reserve banking by keeping a fraction in the bank and lending more than they have, new money is created as more digital currency in the banks’ computers. If banks get into trouble, the Fed can jump in adjusting interest rates, issues reserves, and swapping assets; They can even give short term high-interest loans, but the power of this can only go so far as we saw in 2008. Finally, the collected tax dollars are paid back to the Treasury to ensure the cycle. The Fed also returns most of its interest, despite keeping its principle bonds and other securities. TIP: When the Treasury issues a bond it has to be paid back later with interest. Thus, “interest on debt” is owed to the Fed, to foreign debt holders, to banks, to you, and to anyone else that holds a U.S. bond. We need the Treasury to pay back its debt and its interest on debt, or it’ll compound over time, adding to the national debt. This is true even though the Fed pays back most of its interest. If we have too much debt, our foreign debt holders may lose faith and that could cause the value of our economy to fall. This is true for the Fed as well, as, despite the fact that most of the interest the Fed charges is returned to the treasury, it retains the principle underlying debt. TIP: The cycle explained above is explained very well in the video below. However, a necessary warning, the opinion is given by a “big L” libertarian who sees the Fed as “evil” and is strongly hinting that you buy Gold and Silver. I won’t give my opinion on that, but I will say the doom-and-gloom attitude of the classical liberal gold backs has not changed much since the Gilded Age. It should be taken with a grain of salt. Otherwise, this video is well constructed. The Biggest Scam In The History Of Mankind – Who Owns The Federal Reserve? People want to cry the sky is falling and paint the Fed, banks, IRS, government, etc. as evil but, legitimate concerns aside, this is age old cynicism. NOTE: When the video shows bankers as intermediaries between the Treasury and Fed, it is showing the roles of primary dealers and commercial banks. The video doesn’t explain the vital role they are playing. The point of the check and balance system is keeping rogue hands out of the cookie jar, even at the expense of having the bankers get their hands on some crumbs instead. The commercial bankers are powerful in their own right, but they don’t have governmental power like the other entities, and this is why they work well as a check. Conclusion: Is the Sky Falling? Or is the System Smart? There is always more debt than currency out there. However, paying down our debt, controlling the money supply and interest rates, paying taxes, avoiding a run on the banks in a panic, and producing, working, checking, balancing, and regulating helps to ensure a smooth ride, ideally. It may seem strange having a bank not owned by the U.S. but only until you think about the concept of giving politicians direct control of a national bank. Separation of powers is key. It is not in the people’s interest to have a middle man in-between any two entities. We are doing some risky things with regulation in today’s market even though headway is being made, and special interests are not necessarily under control. Still, the malicious agents don’t tend to be the highly organized Fed and Treasury or even the intermediary commercial banks. Rather, sometimes, it is those you expect the least. For instance, in 2008 crisis, some of the major players were ground floor salesmen paired with short-sighted government policy regarding Fannie, Freddie, and Glass-Steagall. Meanwhile, while sometimes the problem is coming from high up on the food chain, it is often, as in Spain all those years back, a misunderstanding of economy. Worse, is simply those who don’t find America’s future as part of their self-interest, and thus their interest is not the wealth of our nation, but rather only their own shortsighted short-term gain. The takeaway from all this would be: As odd as our system may seem, it is, for the most part, vital. The banking system, Fed, Treasury, IRS, SEC, and even Congress are necessary to ensure America’s power, and the only way to keep that going is by taking regulation, taxes, and our economy seriously and that means creating laws (like regulations) that avoid extremes. TIP: Although Congress, the Treasury, Fed, and Banks “create currency,” it is work that gives currency (and America) value. An hour of labor gives the American economy value as goods and services are produced. And the expectation that this can continue (and thus our debts can be repaid) gives our debt value. The fact that we have an independent within government bank only adds to the confidence. The current system is thus a debt standard based on confidence, and not a gold-standard based on physical gold blocks. This is not nefarious per say, rather it is simply more like how bitcoin works than how the old merchant banks of Venice worked. TIP: The velocity of money describes how many times currency changes hands in a day. If the number is too high it can cause inflation; if the number is too low it can too. The Fed is important as it is a non-government controlled entity that can help curb socioeconomic behavior and consequently the economy by adjusting interest rates. TIP: Fractional reserve banking is why allowing investment banks, insurance banks, and depository banks to merge is bad news. It incentivizes risk, and since the banks are the foundation of the American economy, this usually has negative consequences. There are ways it could work with the right checks and balances in place, but those are still lacking. See Wells Fargo scandal 2016). 1. Introduction, Financial Terms and Concepts. This MIT course is smart (as you could imagine) and it’s pretty unbiased which is always nice. How does the Federal Reserve’s buying and selling of securities relate to the borrowing decisions of the federal government? Does the Fed Feed the Treasury? What’s their Relationship Really Like? You said Kennedy did the same thing as Nixon did. Executive order # 11110 signed by JFK directed the treasury to print United States notes BACKED by silver. Only the amount backed by silver could be printed (in other words the total currency printed was limited to the total amount of actual silver). The Fed is owned by private banks of which most are FOREIGN. It is no more “federal” than Federal Express. You may have a lot of the facts right in the article but I believe you’re missing the big picture. Thomas Jefferson warned us of this very thing. Andrew Jackson famously said his biggest accomplishment was “I killed the bank” speaking of a central bank. He called them a “den of vipers”. Only congress was given the power to issue the currency in gold and silver. Through the actions of the Fed, America has become enslaved to debt. Might want to investigate further (unless you’re a shill for the globalists deliberately misleading the public). No not a shill, just to confirm that. I have a bit of a different perspective from what I do know, but not looking for an echo chamber and value any opinions we can gather here. I do agree with your President-based takes though, in that the Anti-Federalist founders and the Federalist founders (and the modern parties they became, in this case including the pro-gold libertarian party) certainly had very different views on how America should handle a central bank and what currency should be based on. The above links explain how banking, and especially central and international banking, has long been a heated debate. It is complex and history is full of persecution based on it. I think we need to tread very lightly and use a lot of critical thinking when addressing the core of our issues. I am not anti-gold, silver, copper, fiat, or bitcoin, I am really just pro-people and knowledge. So i’m always looking for lessons in history and examining systems to see what is really under the hood. Hope the links help explain aspects of my viewpoint without it seeming like I don’t find wisdom in other parts of the argument. I found the article excellent and plan on forwarding it to some friends. I did however believe you missed an important part of the economy and currency supply- private debt and the so called “shadow” banking system. The fact people can borrow against and for assets also injects liquidity. Does not matter if one takes a Credit Line on their house’s LTV, borrows directly from a dealer for a new car or remodel for that house, – private borrowing acts as currency that immediately effects GDP and the economy. Since it is timed payments on an immediate GDP/liquidity bump, it raises good questions on supply and velocity, based on the return of that debt, but there is little doubt in my mind it’s vital role should be part of your discussion. Thank you for the kind words. The page is a work in progress, am always looking for insights, additions, corrections, and suggestions. The articles on this site aren’t meant to be final versions, they are meant to improve over time with feedback, revisions, and research. As for your comments, I covered this a bit with fractional reserve banking (where lending on reserves is where 97% or so of money comes form), but there certainly more to consider in that conversation. I’ll think on them more and see how I can make sure those topics are covered in a way that fits with what is there.